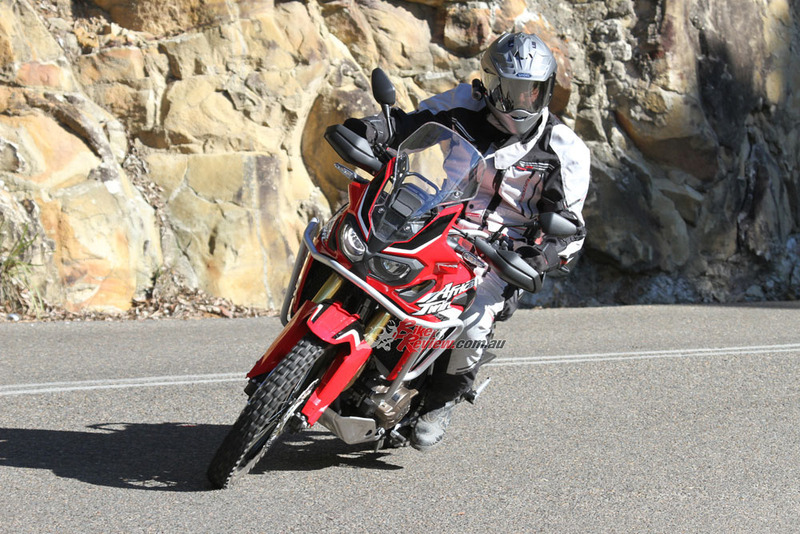 As they tend to do with most of their line up, with the CRF1000LA Africa Twin Honda ignore the peer pressures and race to hit showroom floors that some manufacturers tend to live by. 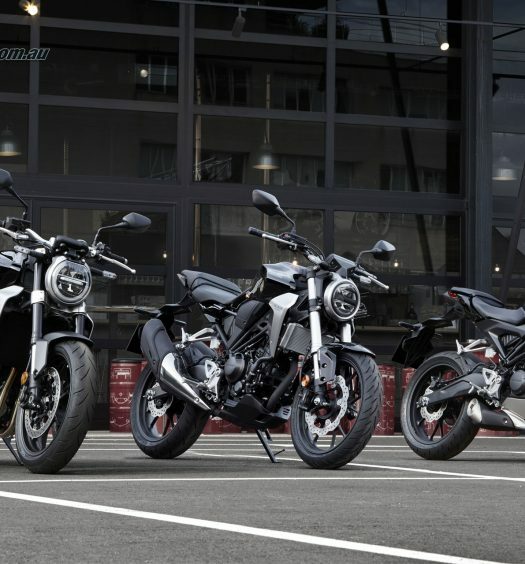 The result is that, yes, we often have to wait an eternity for a new Honda model but that bike will be fully developed and almost certain to be a success. 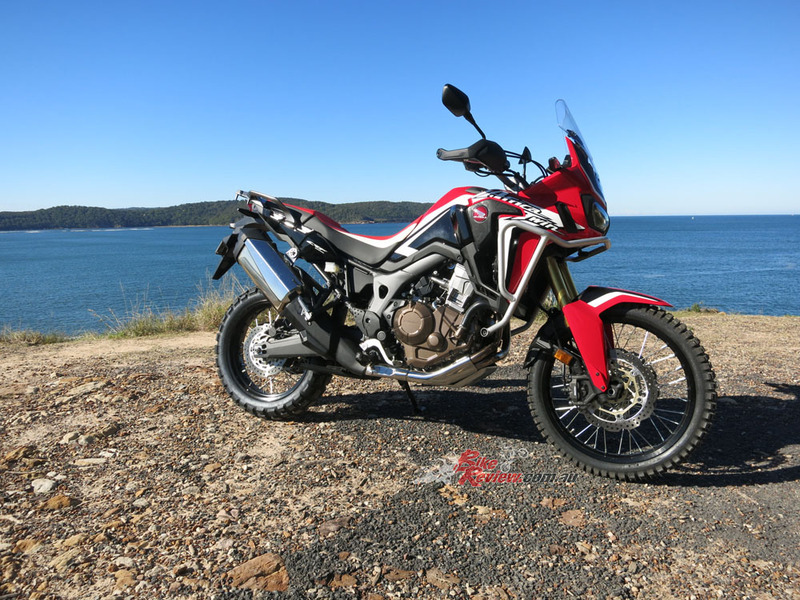 Honda like to get it right before going on sale and so although the Africa Twin should probably have arrived five years ago when the adventure boom started to gain traction, the wait has been worth it. So how is it to ride and live with? The first thing I want to say about this bike is that it is very sharply priced. At $16,990 + ORC as tested, the AT is exceptional value. That kind of money leaves enough to spend on a pipe, a few upgrades and maybe even riding gear and still have change from twenty grand. In this class, that is a good buy. You can read the details of the technical side of the bike below but again for the price point there is a quite a lot of technology in this machine. This is the manual version (there is a DVT model that we will test at some stage), CRF1000LA (A for ABS). 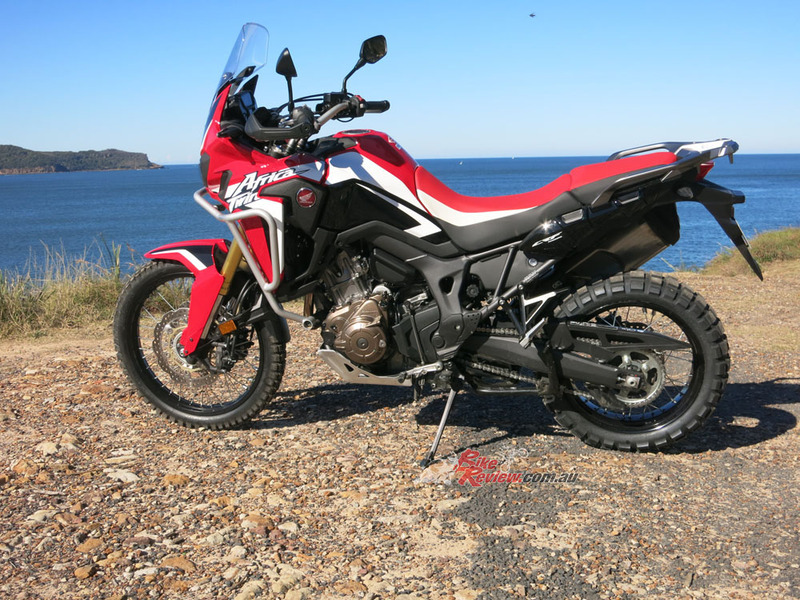 Sadly, the Kumamoto Japan earthquake damaged the Honda factory and Australia is out of stock of the AT until around October this year. Physically, although a huge bike like all ADV machines are, the AT looks compact in comparison. 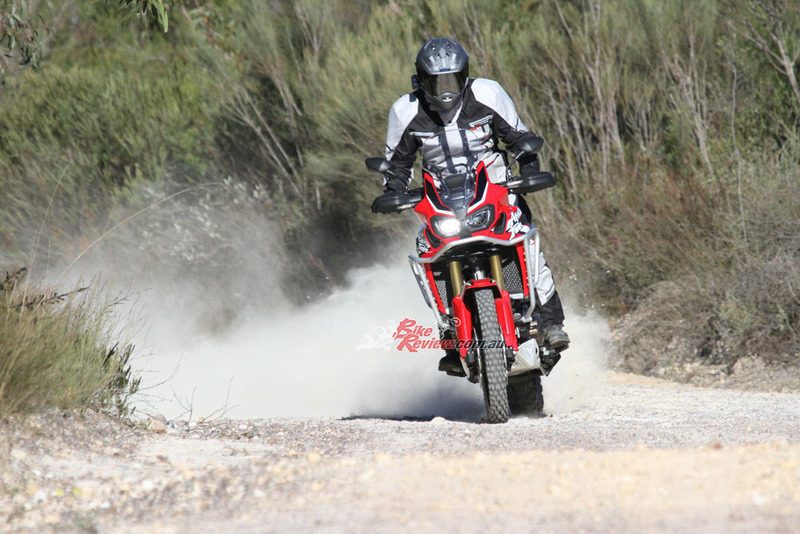 The riding position is more enduro than adventure. The seat low, the ‘bars highish and the bike is really narrow for a 1000. There is minimal bodywork and there are no big bits of engine or anything else hanging off the bike ready to be smashed by rocks and logs, or to be damaged when you drop the bike. For a 1000cc engine the parallel twin is incredibly short and narrow but of course quite tall. 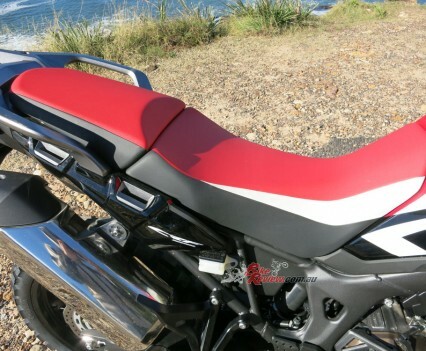 There are large grab rails on the back for luggage, pillions and to help loft the bike onto the tall centre stand. 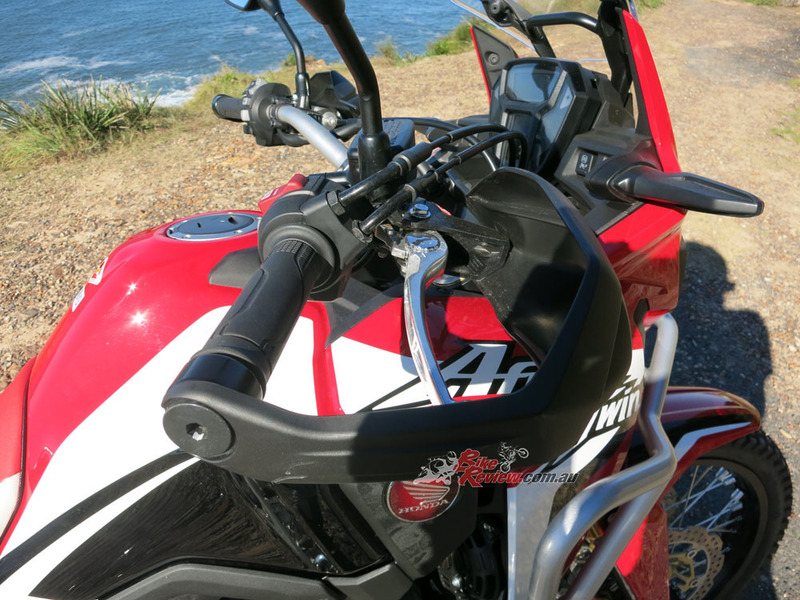 There is a good-sized tall screen for protection and hand guards to keep the fingers safe and warm as well.Overall a nice position to ride from. Firing up the twin is easy and it booms away with a distinct note thanks to the 270º crankshaft. 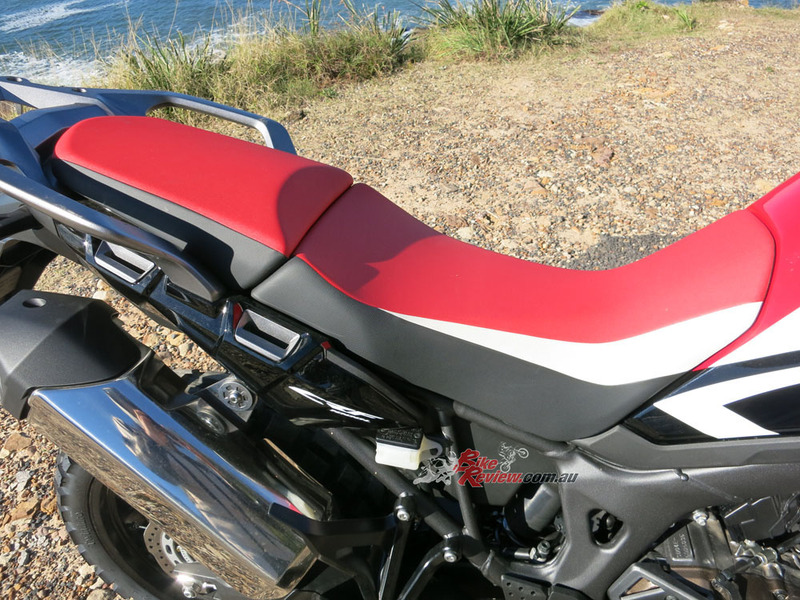 The exhaust note although quiet is actually pretty cool and personally I would not change it but I know virtually every owner will want more bark from the twin. My first ride is in the rain so I select the highest level of traction control, which is the tallest bar on the dash, L3. The way Honda has set up the switch for the traction control is brilliant. It is a small trigger button where the high beam flasher would normally be. Press it once to change the level to the next, again to the next, or hold it down to switch TC off. So simple. 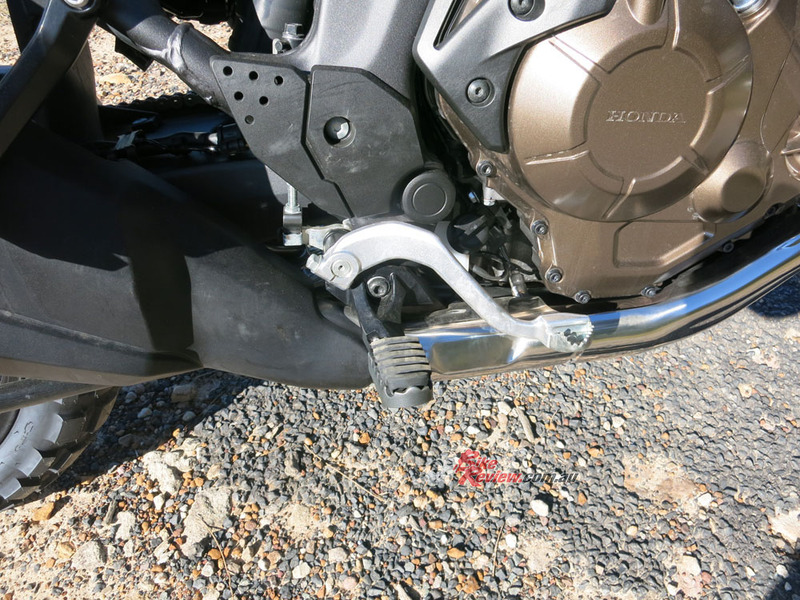 On start up it reverts back to the standard setting, which I think is a smart move, particularly if you have switched it off and forget – or someone else jumps on the bike and does not realise it is off. The benefits outweigh the small inconvenience of setting it back to where you want it, as the system is so quick and easy to change. As I power off up the road on the big AT I’m immediately struck by how flat and tractable the power really is. At first the bike feels underwhelming but one thing I have learned over the years is when a bike feels smooth and slow it is usually very fast from point A to point B. The 998cc twin is fooling me as although there is no arm stretching pull from the AT the speed is there and it all happens so effortlessly. There is a constant surge of power available. Within a few kilometres I decide that L3 of the TC is way too intrusive, even in the wet, and actually cuts in almost every time the throttle is opened. L2 is much better in the wet and I later discover L1 in drying conditions. The Continental knobbies are struggling to find grip on tarmac in the wet of course and I am grateful for the traction control and ABS. The gearbox is silky smooth and so is clutch action, which is light and smooth, making low speed riding easy particularly in heavy stop start traffic. In these wet conditions the soft initial bite of the front brakes is great, allowing me to modulate pressure and pull the bike up well, although the tyre does let go and the ABS kicks in into some tighter hairpins. I’m more used to road rubber so the ABS is definitely saving my skin as I push the AT beyond where it is meant to be pushed in these conditions. The weather clears up and I flick to L1 HSTC (Honda Selectable Torque Control) and just enjoy a reasonable pace, in comfort, with real ease. I can’t stress how easy this bike is to ride and not at all intimidating, as it’s physical presence might suggest. I detour off the freeway and hit my local twisties and a long country road. Turning the traction control off I have a good old go. It’s immediately clear that the luxuriously comfortable sports touring suspension doesn’t like to be pushed too hard. Both ends need more spring support for serious riding. I found the front particularly soft, with a lot of dive on the brakes. Easy fixed though and the bike was never meant to be a sportsbike, however, it is possible to ride some of the competition much harder on the tarmac. Braking performance is outstanding and again, that engine just gives and gives. It won’t break any horsepower records but provides reliable, progressive power whenever it is asked of it. A brilliant engine that rewards the rider well. 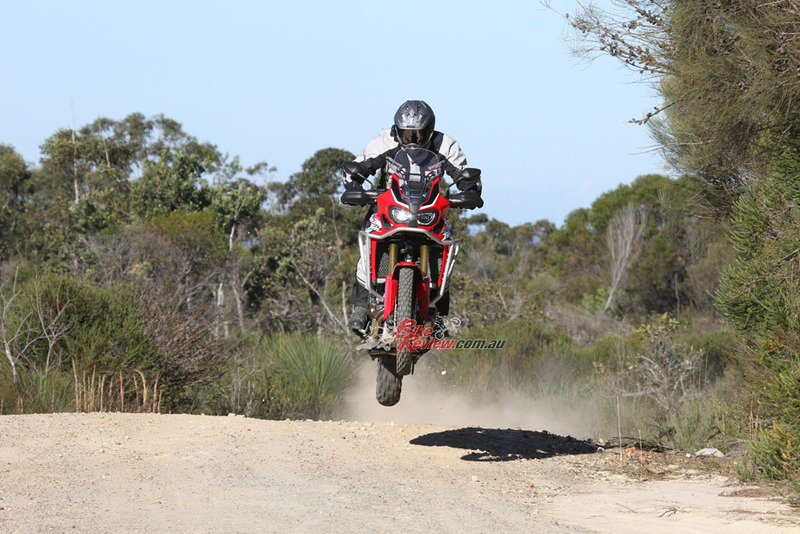 Rolling off the throttle, flicking the indicator on and peeling off a main road to go bush is fun. I hit up my favourite local fire trails and dirt roads on the Africa Twin and twice get home after dark because I’m just having so much fun. And yes the LED headlights are good in the bush at night. 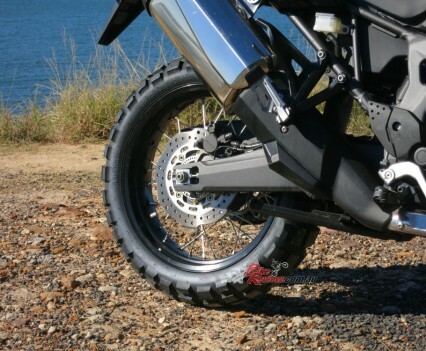 High-speed dirt road riding is comfortable and easy, with the super soft suspension soaking up all irregularities and corrugations. 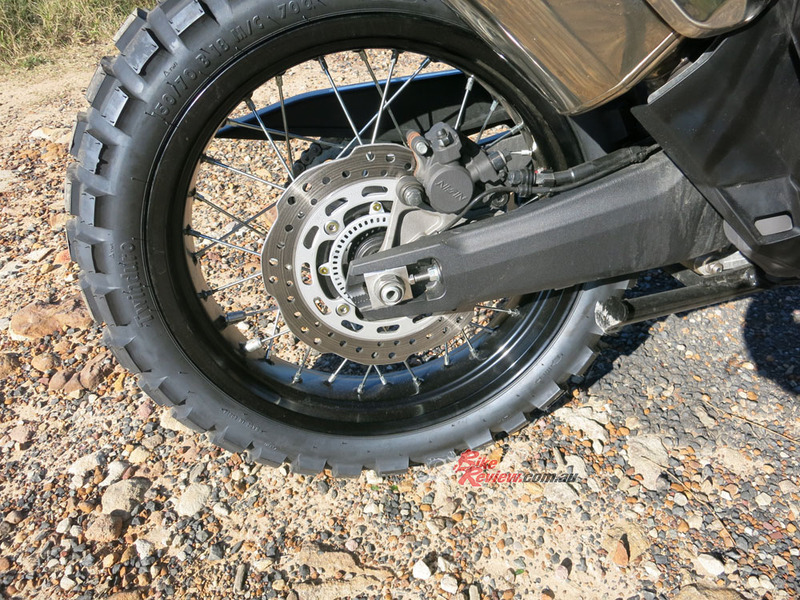 The tractable engine hooks up and there is a good connection between the throttle and rear tyre, while some other adventure bikes explode into wheelspin as you hold on and steer! I experimented with the TC and L1 was not too bad on the more open roads but switching it off definitely gives me better control, in particular the ability to rear wheel steer, crucial on these beasts. In the tighter trails with jumps and whoops I start to push the bike a bit harder and I find the limitation of the suspension. 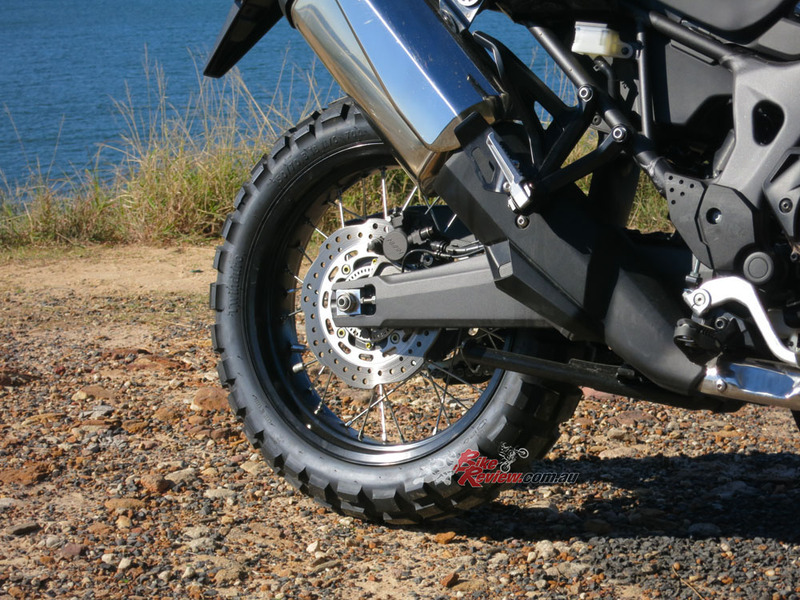 Backing off and riding within the bike’s limits gives a more rewarding experience. As long as I ride the bike smoothly and with finesse I can carry incredible pace through the trails, including getting some big air over crests at high speeds. 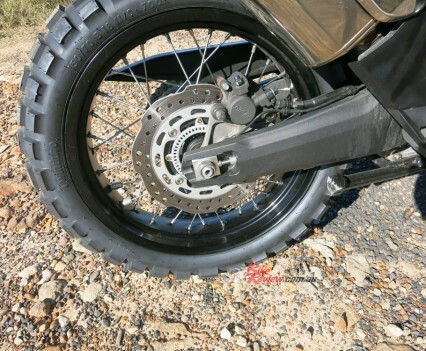 Any aggressive moves on the throttle or brakes upset the bike’s balance though and this is all down to spring rates and valving in the forks and shock so no big deal.It could easily be dialled out or fixed internally and honestly only an issue for serious riders. 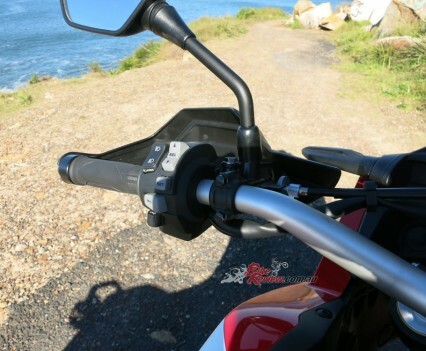 The Africa Twin is, out of the crate, set-up for the intermediate adventure rider so faster or more experienced riders will find the limitations of the suspension settings quickly. However, these are only adjustments and perhaps spring support to take it further. 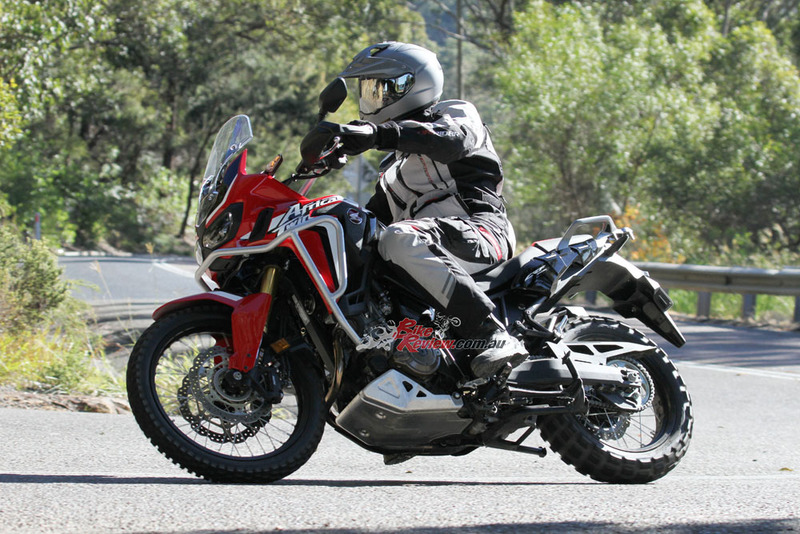 From my point of view the Africa Twin is the ideal adventure bike. 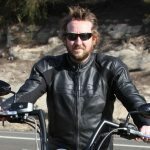 Most of my experience is road racing or road riding. Although I rode dirt bikes when I was a kid and still do from time to time, I can’t take full advantage of a true hard-core adventure bike. On the Honda, however, I felt confident, comfortable and as though I was riding safely within my limits at all times. 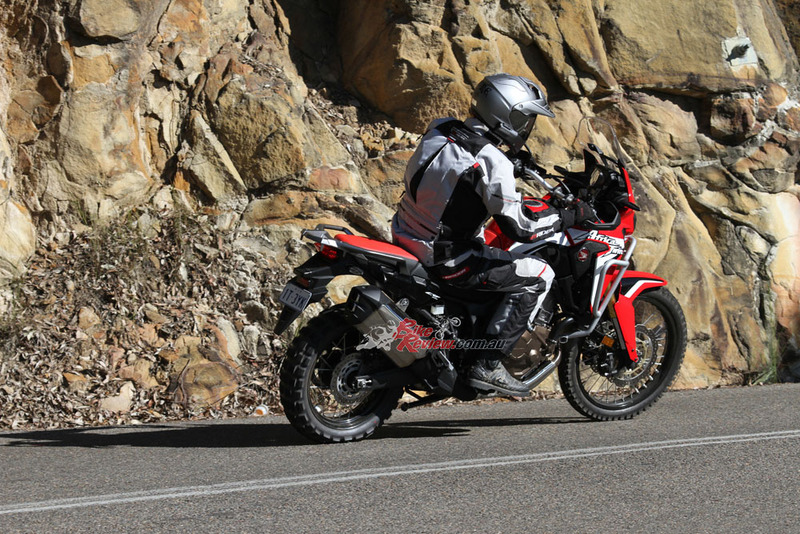 The Africa Twin engine has been designed with two key things in mind, useability and tractability. This has given the bike an easy to ride feel good for touring and off road adventure. The 998cc parallel twin has been built with weight saving, compactness and low central mass in mind. Honda wanted a short engine and the 500 is as short as the CB500 engine, while a V-twin would be too long for what Honda wanted to achieve. 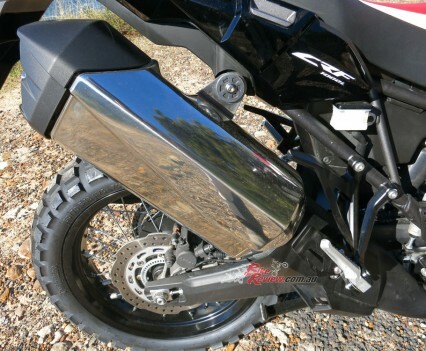 The crankcases are split vertically and feature a built-in oil tank to make it a semi dry-sump, helping ground clearance. The water pump is housed in the clutch cover, a first for any bike engine, and the thermostat is part of the cylinder-head. The balance shafts drive both the water and oil pumps. The four-valve heads are twin spark plug units for optimum burn and low speed running for the large combustion chamber area and have dual and sequential ignition control. Compression ratio is 10:1. 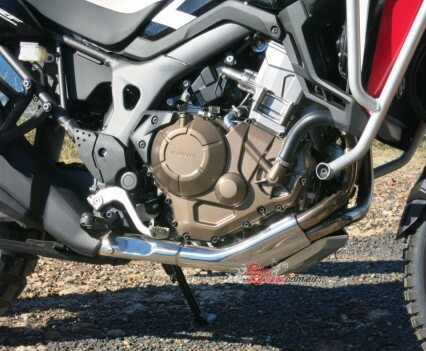 Like the CRF250 and 450R, the CRF1000L features a Unicam valve train allows a low-set position of the cam, therefore allowing a steeper included valve angle without too much cylinder-head height, although the head is still quite long being a 1000cc engine. Valve sizes are 36.5mm IN and 31mm EX. The 270º firing order of the engine gives tractable pulse power deliver. Vibrations are minimised by the mutually reciprocating motion of the pistons, a front two-weight balance shaft and a rear balance shaft. The pistons are resin coated cast alloy CAE designed units and piston pins and conrods are AB-1 chromium plated. 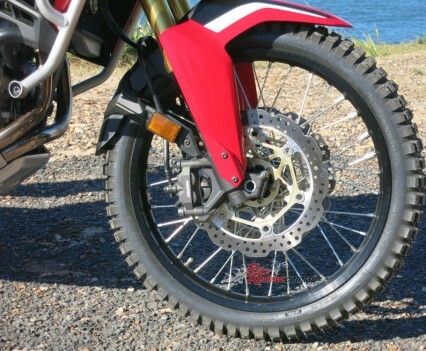 The clutch is an all alloy slipper unit and sift cam design is the same as in the CR250 and 450. Controlling the engine is possible with the electronic aids. 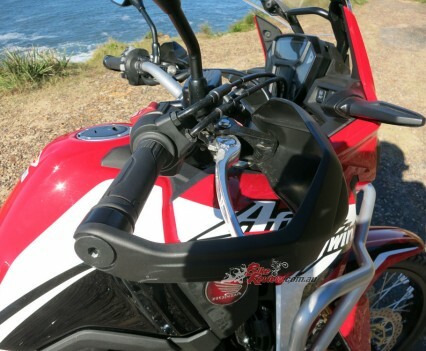 There are three levels of traction control as well as off, easily switched with a toggle button on the left handlebar. 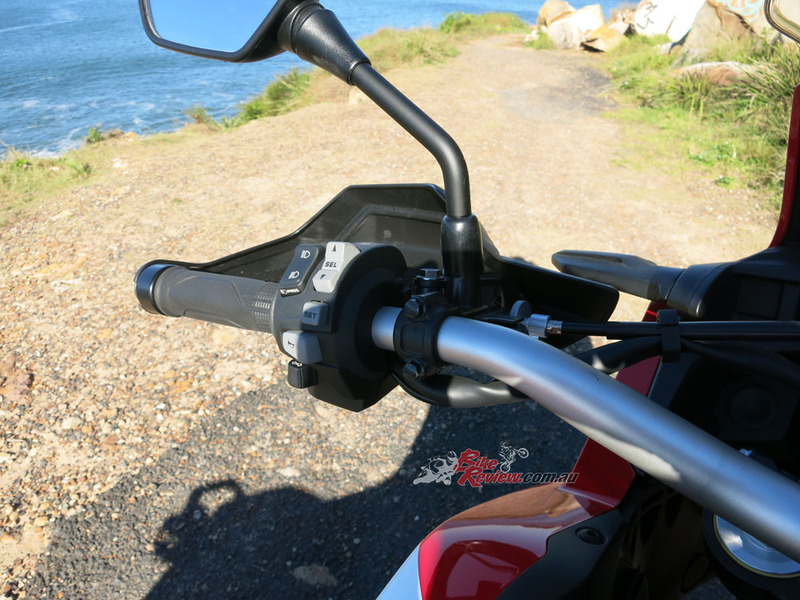 The frame of the Africa Twin is a semi-double cradle unit made from steel. Due to the compact frame and engine, ground clearance is 250mm and wheelbase 1575mm. Rake and trail are 27.5º/113mm while the bike weighs 232kg as tested wet. Weight split is 49.1/50.9 while seat height can be adjusted from 850mm-870mm. The bike has a turning circle of 2.6m due to a 43º lock. Up front Showa 45mm cartridge forks offer 230mm of travel for the 21in wire wheel, which is mounted with a leading front axle. The forks are fully adjustable. The top triple-clamp is cast while the meaty bottom triple tree is a forged item. The steering stem is lightweight alloy. The rear Showa Pro-Link set-up offers 220mm of travel and is adjustable for preload, compression and rebound. 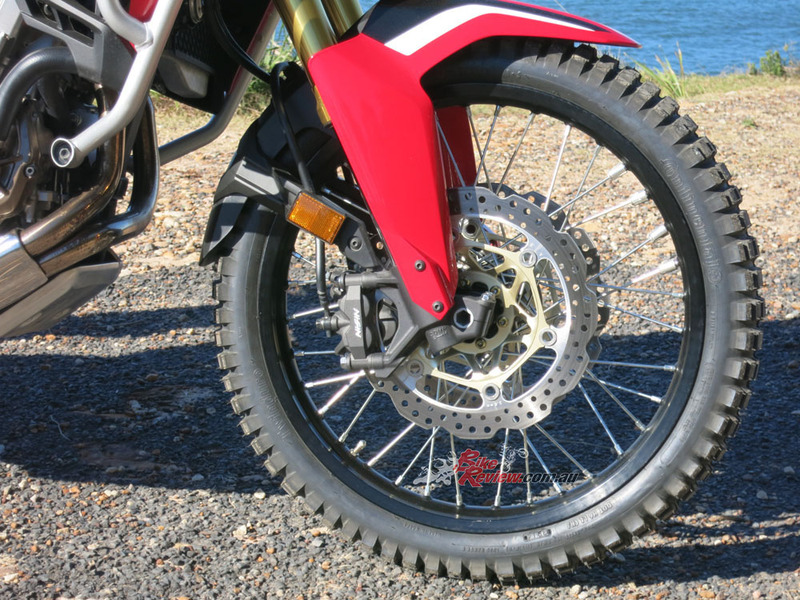 The shock has a 46mm cylinder and remote reservoir, as used by the CRF motocrossers. 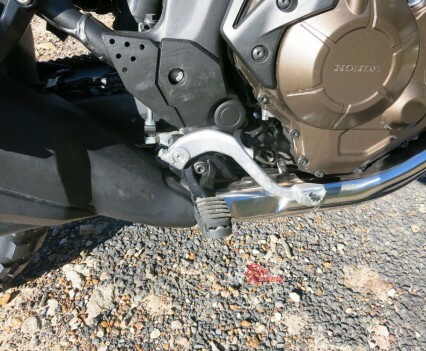 The alloy swingarm mounts via hollow 17mm bolts and the rear wheel is a 4.00 x 18in spoked item. Both wheels have alloy rims. 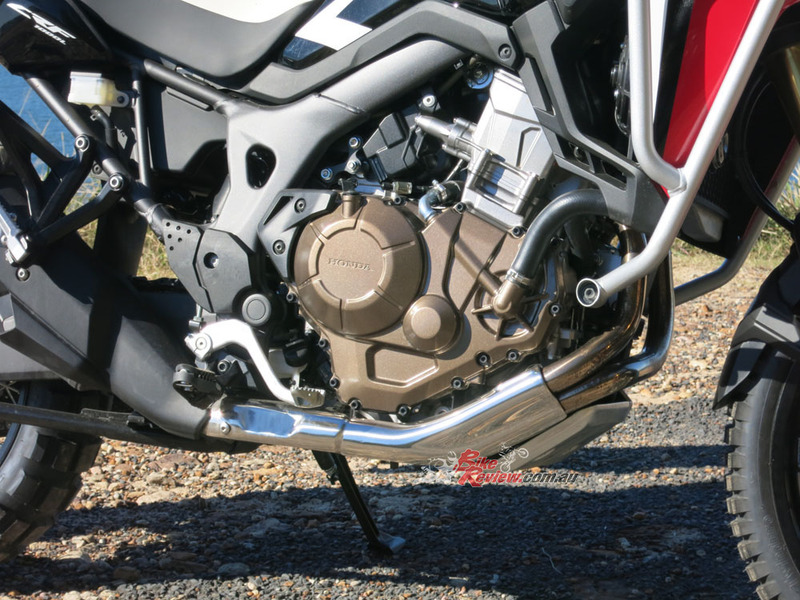 Braking on the Africa Twin is taken care of by 2-Channel ABS (as tested), 310mm wave floating rotors and Nissin four-piston radial-mount calipers at the front plus a 256mm wave rotor and single-piston caliper at the rear. 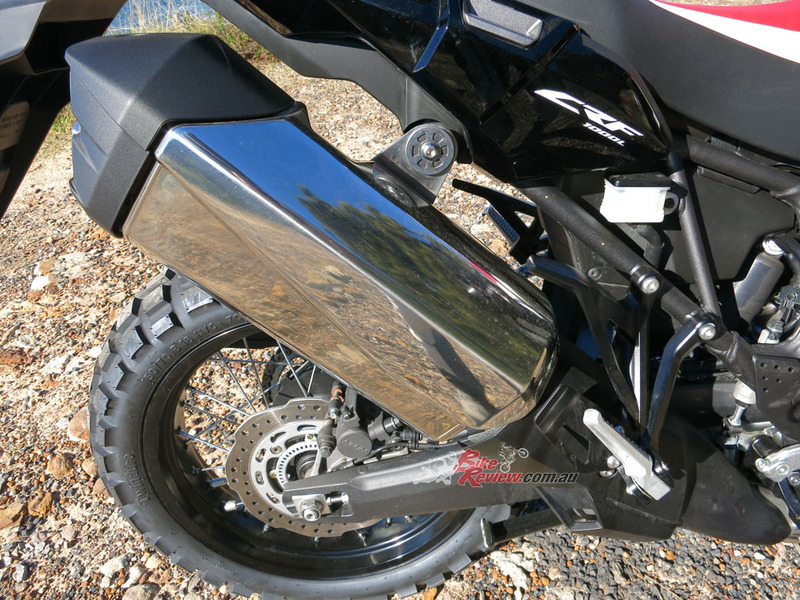 Styling-wise the Africa Twin has been kept as minimal and slim as possible while still offering rider protection. Lights are LED and a tribute to the Twin Ring original AT. The front cowl and screen are an integrated unit and a 90mm taller, 30mm wider screen is an option. Multiple baffle plates direct cool air to the engine under all conditions, while a total of 18 flow spoilers and ports. The LCD dash is vertically stacked and designed straight from rally race bike experience. 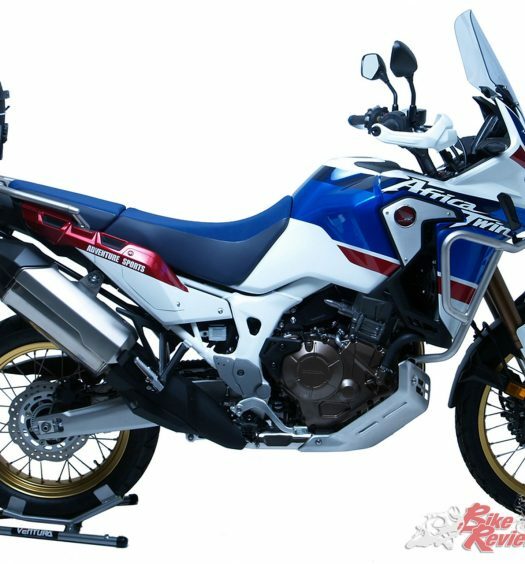 A full range of accessories are available for the Africa Twin including a top box, panniers, smoke screen, multiple wind deflectors, rubber pillion pegs, heated grips, 12V socket, fog lamp, wheel stripes and alarm. Brakes: Front: 2-Channel ABS with rear off switch, 310mm wave rotors with radial-mount calipers, Rear: 256mm wave rotor with single-piston caliper. Wheels & Tyres: Wire spoke with alloy rim, 21 x 2.15 (f), 18 x 4.00 (r), 90/90-21, 150/70-18 Continental TKC80 as tested. Instruments: Rally style LCD display with: Speedo, Tacho, Fuel, Gear, Odo, Trip, Clock, ABC and TC settings, Temp. Thanks Jack! It’s a great bike.